Growing up in Brooklyn, New York in the 1950’s and 1960’s was like growing up in the shadow of the Second World War. To know about the Holocaust is one thing, but to live amongst people who were affected by it; either by a friends family members, who were left behind in Europe and never made it through the war, or the many survivors; or refugees as they were known; who bore the blue inked numerical tattoo affixed to their wrists, was quite another. That tattoo identified them as survivors of the death camps, and these persons were revered, as they had looked death squarely in the eye and lived. 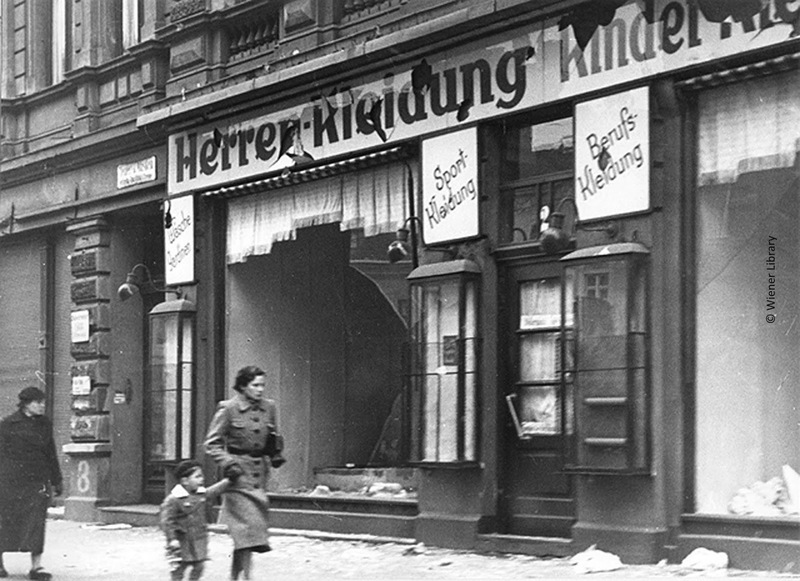 Today is the 75th anniversary of Kristallnacht, or the “Night of Broken Glass”. This photo shows the shock and fear on the faces of the little boy and his mother, prompting me to wonder if they were Jewish. Most likely they were not; as any sane person of Jewish heritage would have been indoors when this photo was taken after the first night of killing and burning had ended. But shock and fear know no ethnic boundaries, and these 2 people may just be reacting to the world having gone mad; seemingly in an instant; although the storm had been gathering since about 1933. Like Katrina in New Orleans, most people hoped the big storm would never arrive, changing everything. The toll from the Night of Broken Glass was written up in terms of how many buildings destroyed, how many lives lost and the like. But all of those figures can never do justice to what was really lost in that night of Nazi fueled hatred. The 267 synagogues, stores, and homes destroyed that night at the direction of the Nazis, along with the vandalism of 7,500 Jewish businesses, and the killing of almost 100 Jewish people were just the tangible portion of the damage. The events of November 9-10, 1938, while police and firemen stood by and watched; or turned a blind eye; signaled the selling of the German soul. And the judgment for that would be severe. Kristallnacht marked the point of the Third Reich in which vulgar political rhetoric became vulgar acts of criminality. These acts would grow into the largest attempt ever made to annihilate any particular group of people. And that is the point of marking this grim anniversary. In our country today, we have so many hate groups, all engaged in violent and inhuman rhetoric. And that’s how it starts. With a bit of talk, leading people to become jaded in the face of veiled racism and prejudice. And, what happens later, when it all spirals out of control? You wind up walking down a street scarred by once seemingly innocuous words; windows broken and holding your child’s hand in fear for the loss of everything you have ever known. Especially your own self-respect.